I needed some ladybugs, so I collected a bunch of stinging nettles. Nettles are also good for food, provided that you pick them young and cook them before touching them to your bare skin. 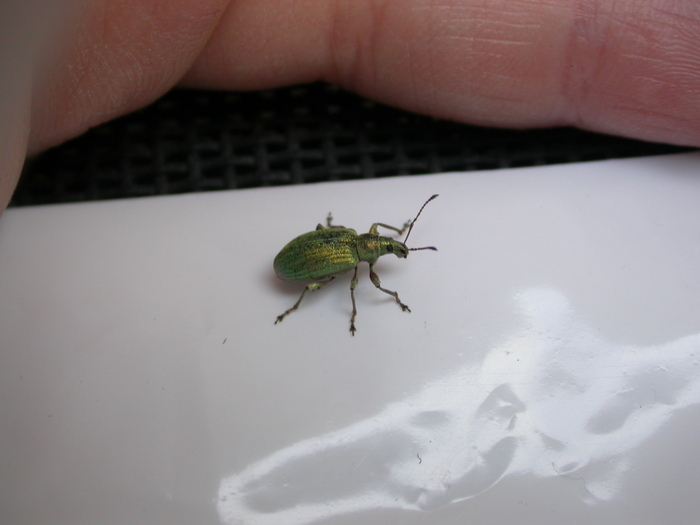 Our nettles also came with some weevils. Having guests offers a great opportunity to be a tourist in your home country. 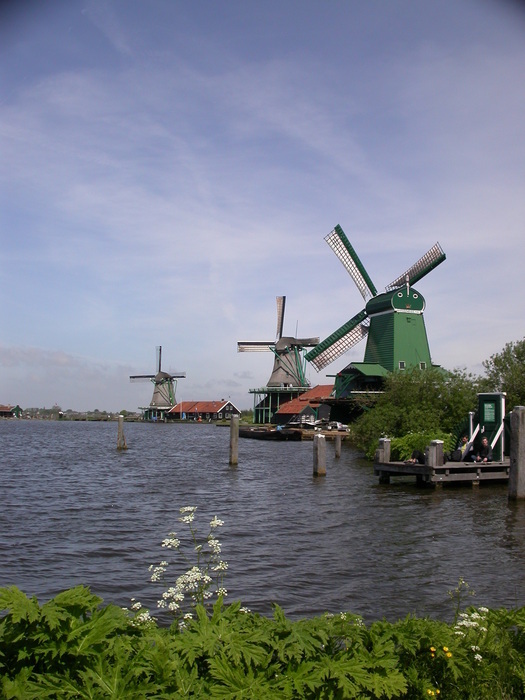 Our guests wanted to see some windmills, so we traveled to the canal-side town of Zaanse Schans. We got off of the train and immediately noted an odd smell to the air. Cheese-its? Ferrets? Chocolate? 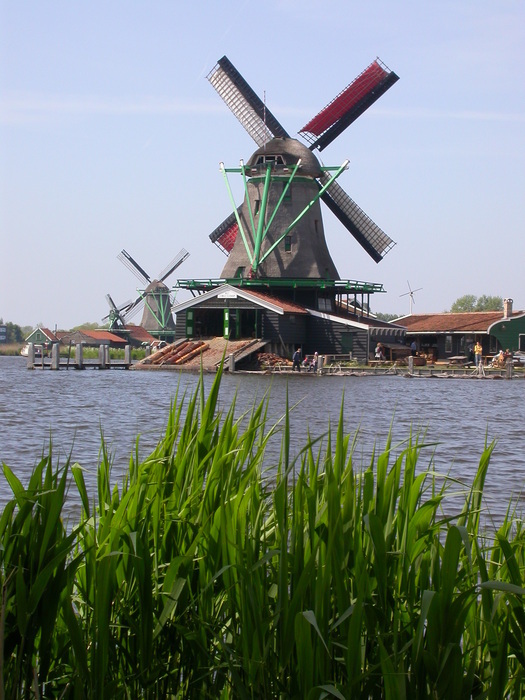 Turns out chocolate was a good guess - Zaanse Schans has been active in the chocolate industry for many years. 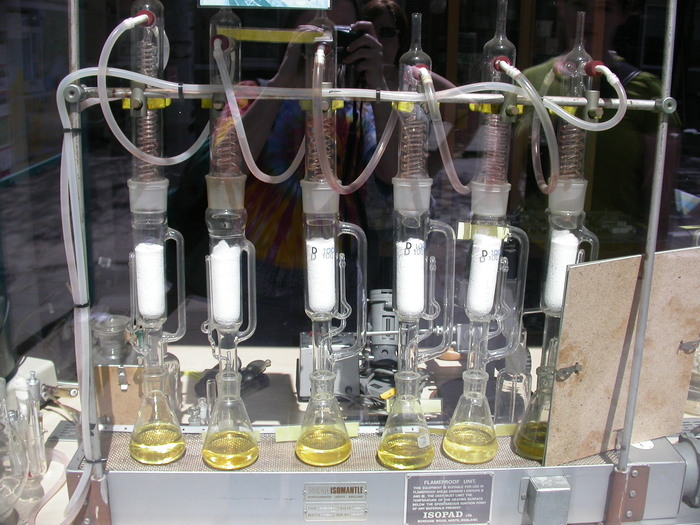 This shop had some old chemistry equipment in the window - but were unfortunately not open on this holiday weekend. Grist and sea... the history of the Netherlands in a picture. 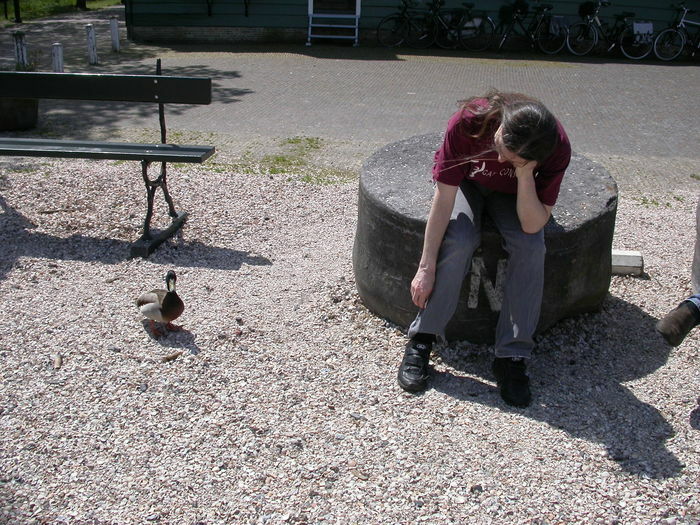 One of the local ducks getting in on the tourist industry. De gekroonde Poelenburg, De Kat, and De Zoeker. The crowned Poelenburg (poel is pronounced pool and means exactly that: a pool of water; poelen is the plural. Poelenburg is the name of a part of the city nearby.) The original mill on this location was built in 1731. It burnt down in 1903, but in 1963 a mill called De Locomotief was moved from the nearby Koog aan de Zaan to this location and renamed De gekroonde Polenburg . De Kat means The Cat and is a paint mill. It was built in 1781 and remained in operation until 1904. 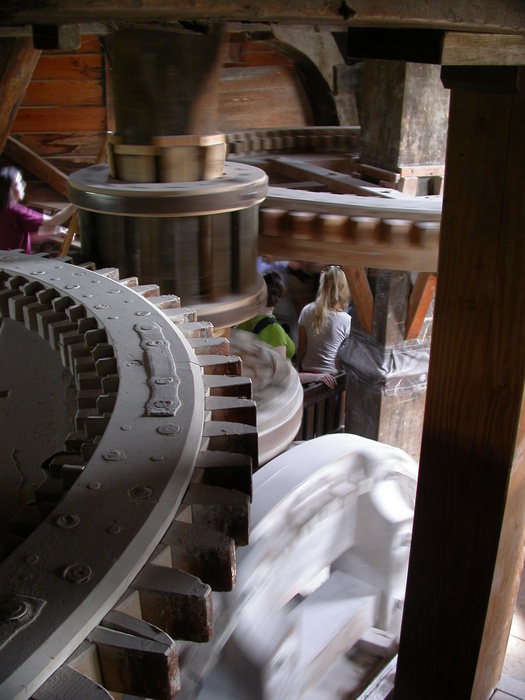 In the 1960's the broken mechanisms were replaced with parts from the mill De Duinjager . Pigments ground by the mill are sold downstairs. 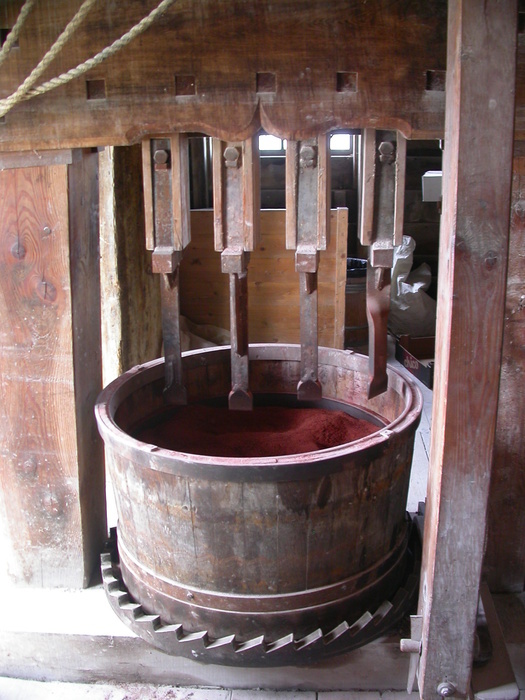 De Zoeker means the seeker and is an oil mill - for milling the oil from oily seeds, such as sunflower. 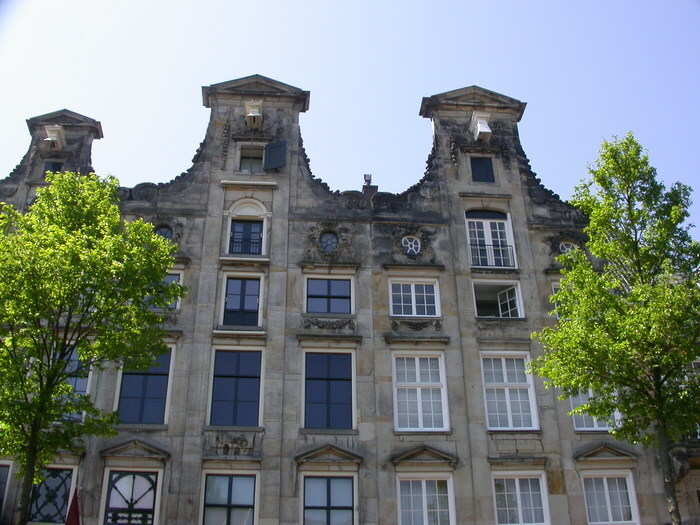 It was built in 1686 in Zaandijk and remained in operation there until 1968. 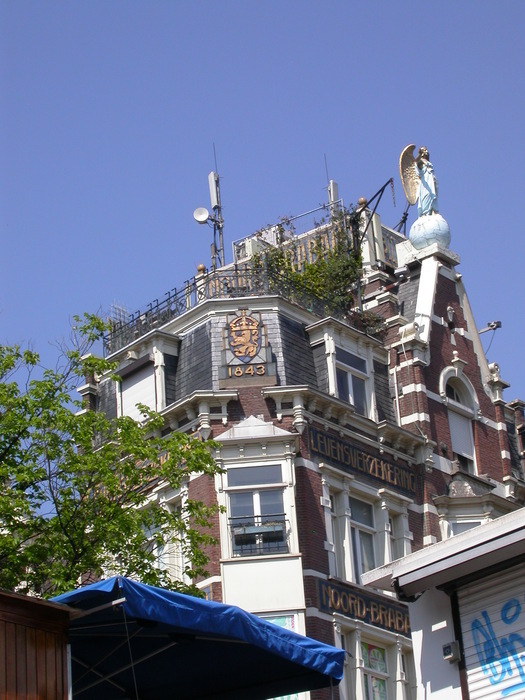 At that time it was moved in one night, via the Dutch rail, to its current location. It is still functional, and is run by volunteers during the summer. Het Jonge Schaap ( The Young Sheep ), a sawmill which was built here by volunteers in 2007, using detailed plans drawn from the mill which stood in this location from 1680 to 1942. Het Jonge Schaap is open for tours. All the work is done by the wind. The metal cogwheel just in front of Eric advances the wood. The blades divide this log into four planks at a rate of about a millimeter a minute. 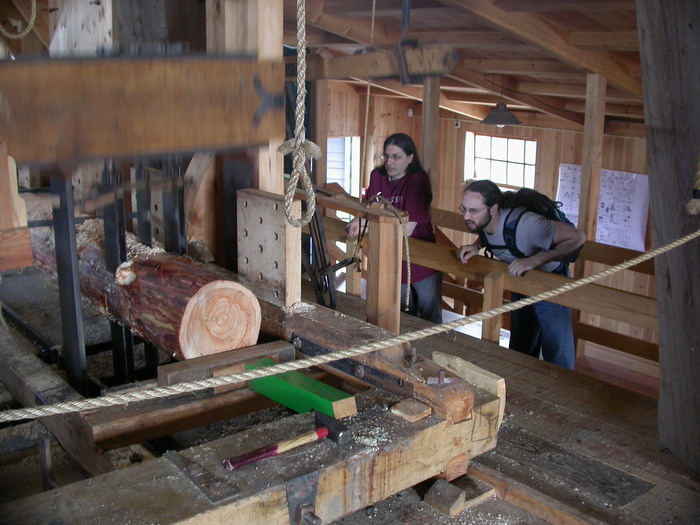 For demonstration purposes they only saw one log at a time, but the mill is built to handle four logs at once. The blades are completely adjustable, so this could make many board-feet at the same time. And, in any case, it sure beats doing the sawing by hand. 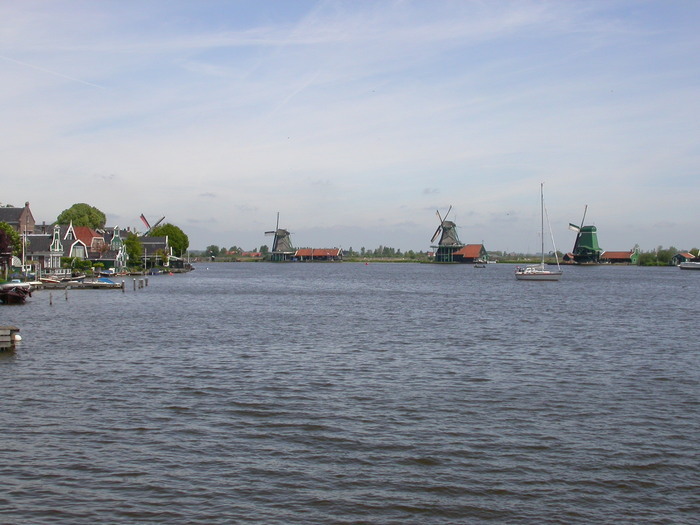 In the life of the original mill, logs were floated up the river from Germany and brought by sea from Portugal, to be turned into planks for the VOC ships. 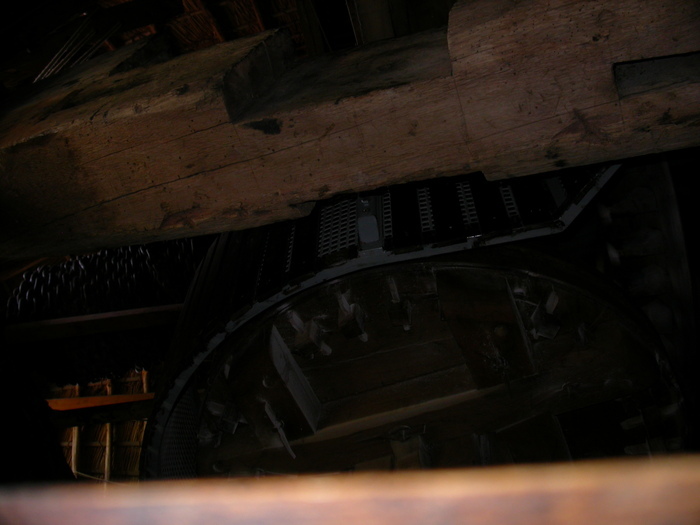 The mechanism driving the saws of Het Jonge Schaap. 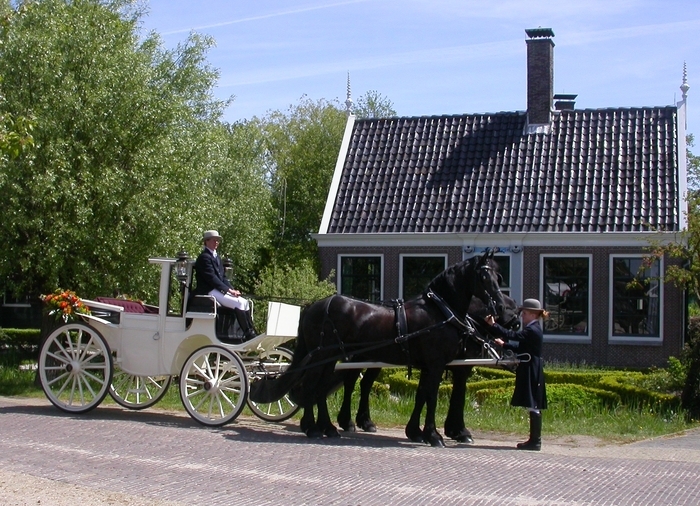 De Kat and De gekroonde Poelenburg from Het Jonge Schaap. 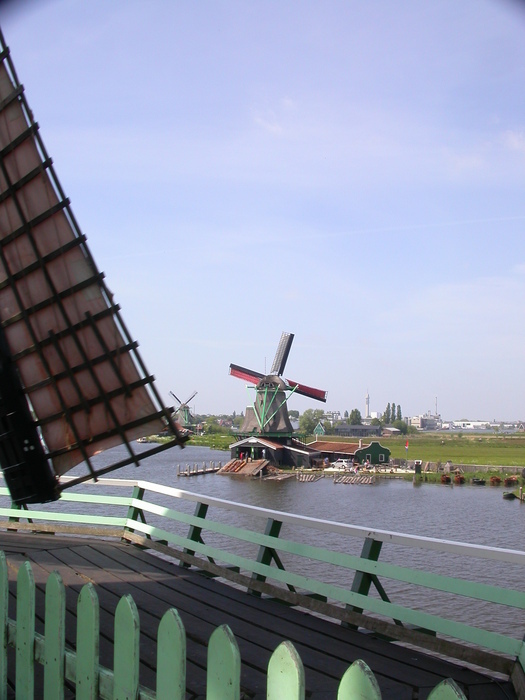 In order to make efficient use of the wind, a windmill must rotate. 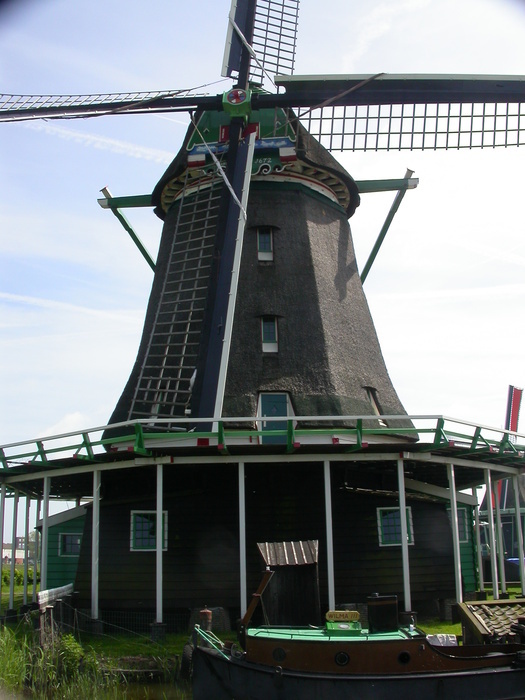 Het Jonge Schaap makes use of a design where only the top part rotates with the wind, leaving the base steady. 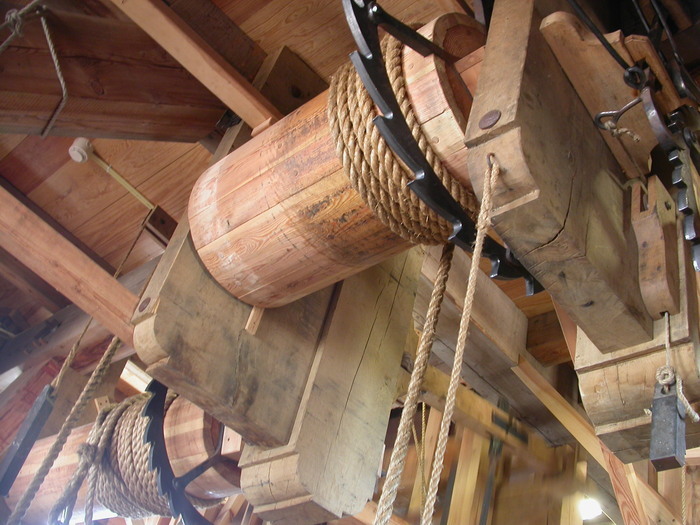 This is especially handy in a sawmill, since the logs come in by water and it would be difficult to ensure that the logs could come in on every side. What kind of bird is that? The source of the loud peeping from the fields by the windmills became apparent as soon as we pushed aside the tall grass. There were 4 or 5 of them, this one was the most photogenic. 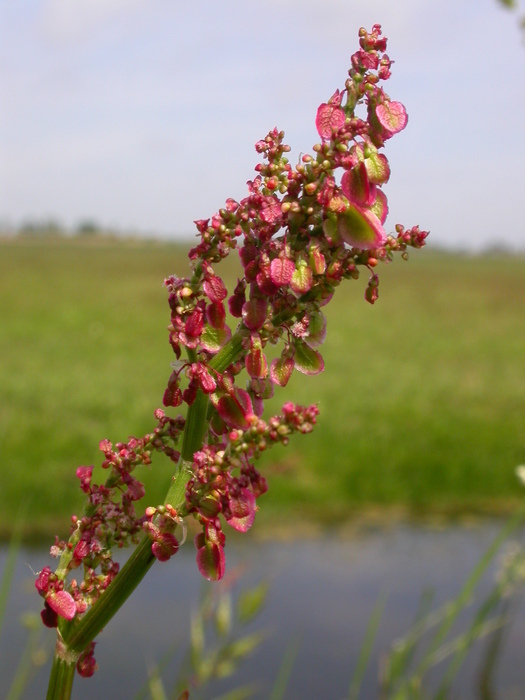 An as-yet-unidentified red weed growing along the edge of the canal. De Bonte Hen , the last windmill along this dijk. 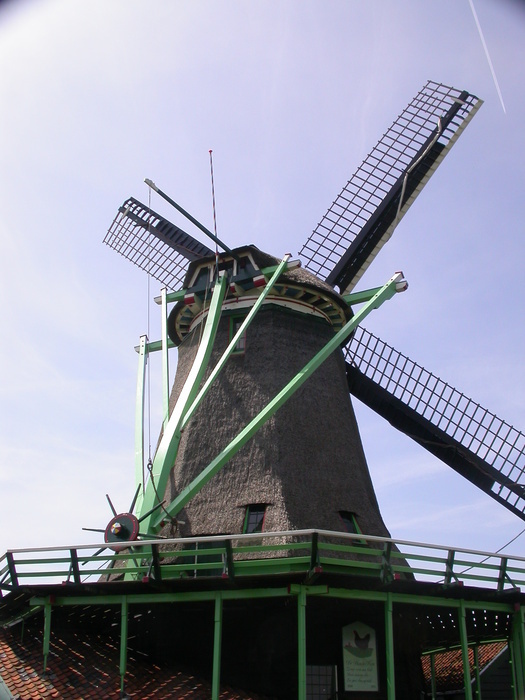 Like De Zoeker, it is an oil mill. 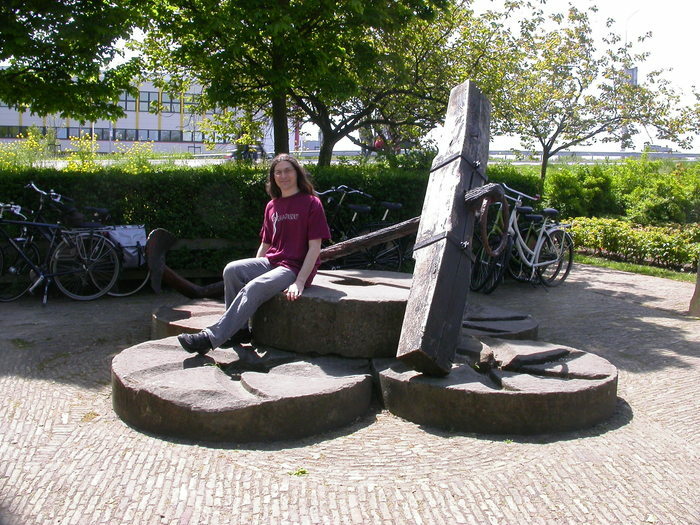 In this photo you can see the wheel used to turn the top so that the blades are facing into the wind. 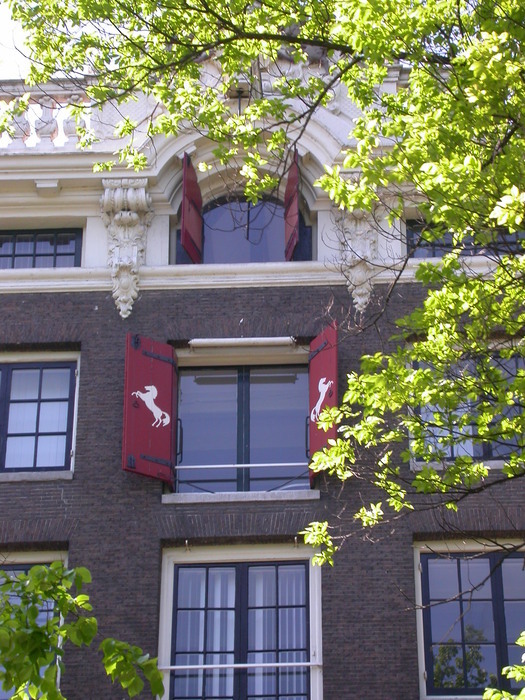 A closer look at De Zoeker. De Kat also has tours. The first sight that greets you upon entry is two enormous stones on end, whirling around at a full rotation every 10 seconds or so, crushing something to a powder. I'm surprised they let you get this... close... said one of our American guests. Indeed, you can walk right up to the gargantuan, bone-crushing stones and stick your finger right in if you wish. But I think they trust that all visitors will have more sense than that. 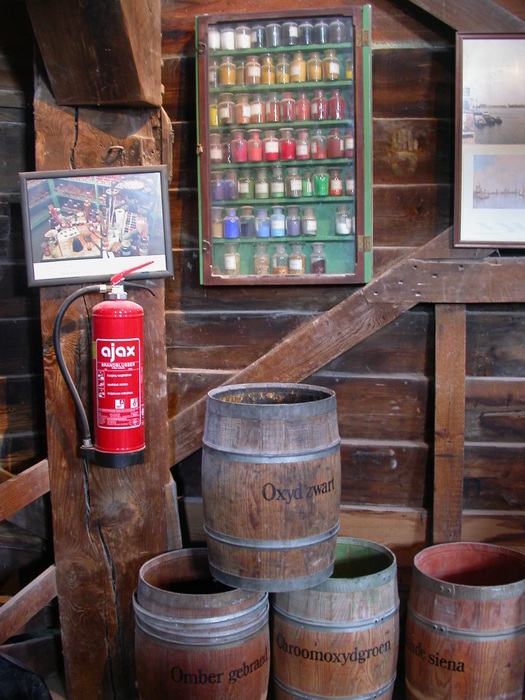 De Kat is a paint mill, grinding chalk and other substances into paint and pigments. 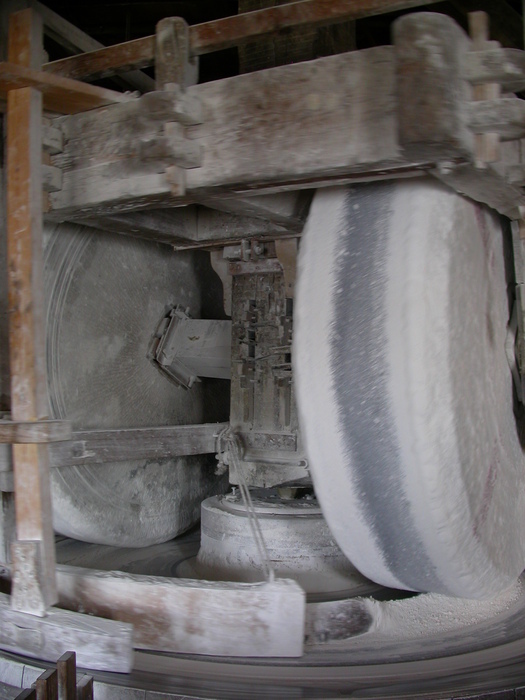 This part chops the raw material into something fine enough for the large stones to powder. The best part about De Kat is that there are stairs/ladders leading up inside it. This is the first floor - one floor above the ground. 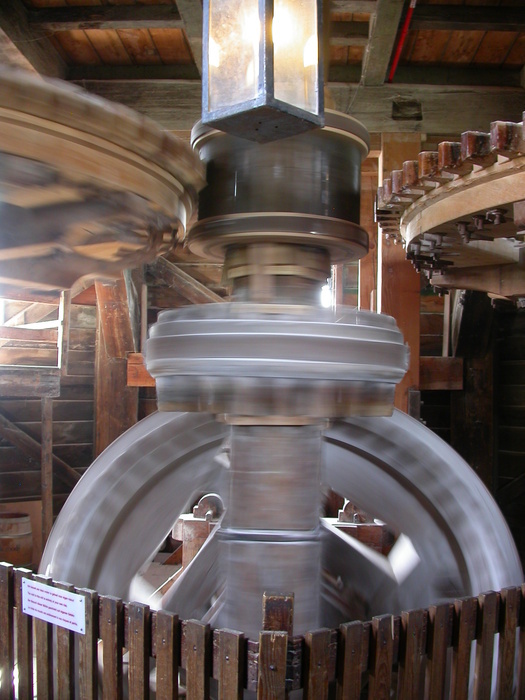 The middle shaft is being powered directly by the wind, which in turn turns giant wooden gears. The one on the right is not hooked up, so you can see its construction. A flash photo freezes the gears in time to see the rest. The motion photo is nicer, although the many shims and other evidence of repairs is interesting. Pigments. Many of the colors are familiar, such as burnt umber and burnt sienna. 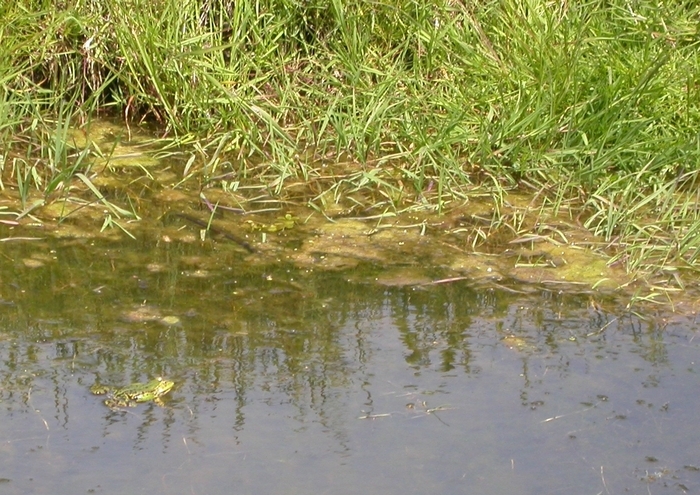 Chroomoxydgroen is responsible for the infamous Institution Green. The view from the stairs. Note Eric (in the red shirt) going up the other set of stairs . Also a nice close look at the construction of the gears. 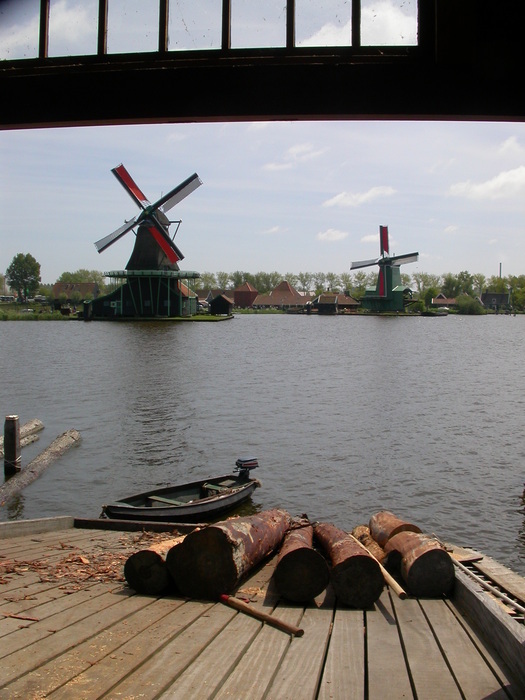 The view of Het Jonge Schaap from the deck of De Kat. The blades of De Kat are turning, by the way, as this shot amply illustrates. Looking up at the third floor, unfortunately closed to visitors. 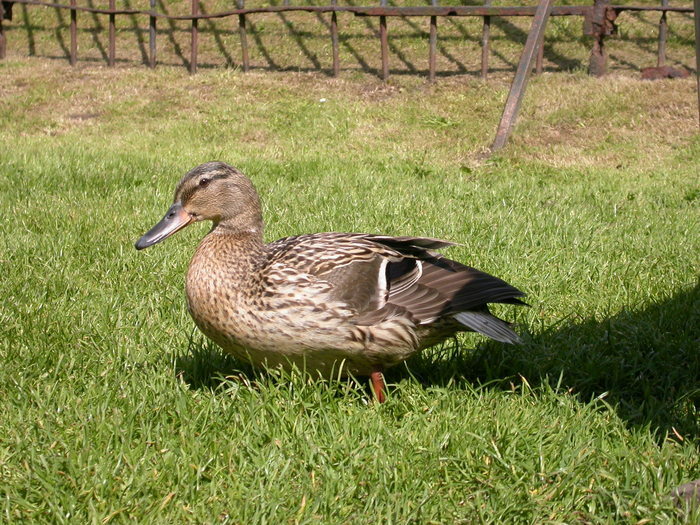 No, this is not a goose with acne, although it is one ugly duckling. 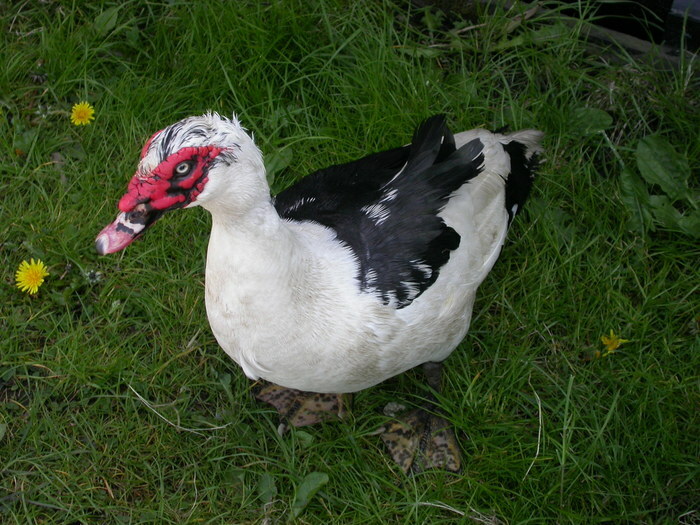 This is a Muscovy duck, a Central American species which lives domesticated in The Netherlands and many other places. 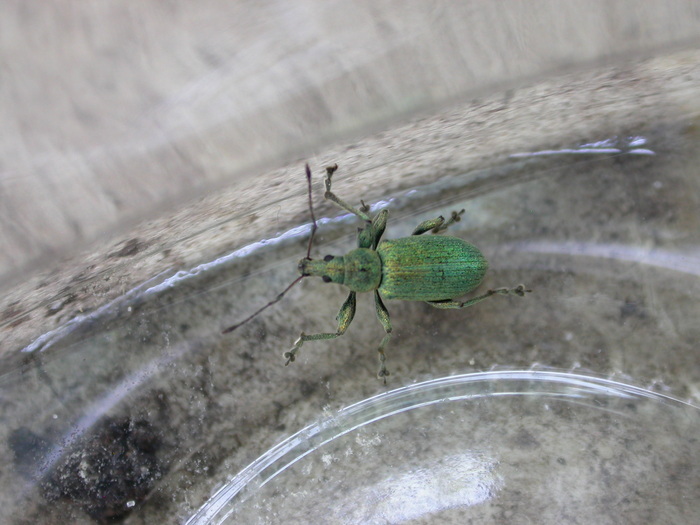 Apparently they like to eat mosquitoes, which would certainly make them a handy pet in the swampy Schans. This one needs a toe nail trim. He lives on the cheese farm with the goats. 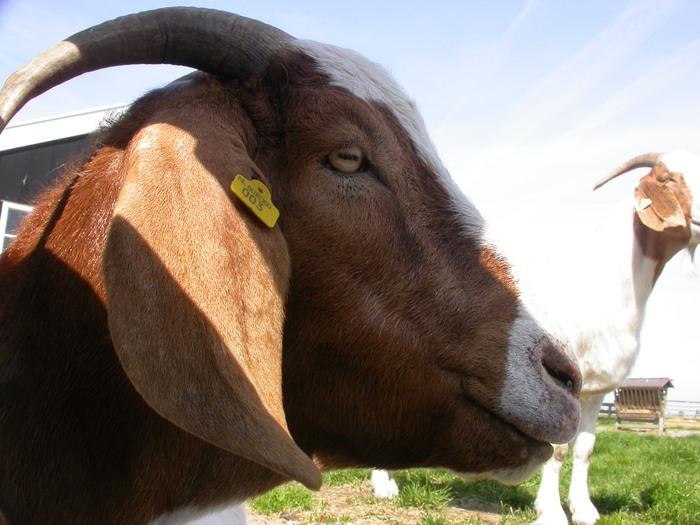 The best thing about goats is their eyes - gotta love rectangular pupils. 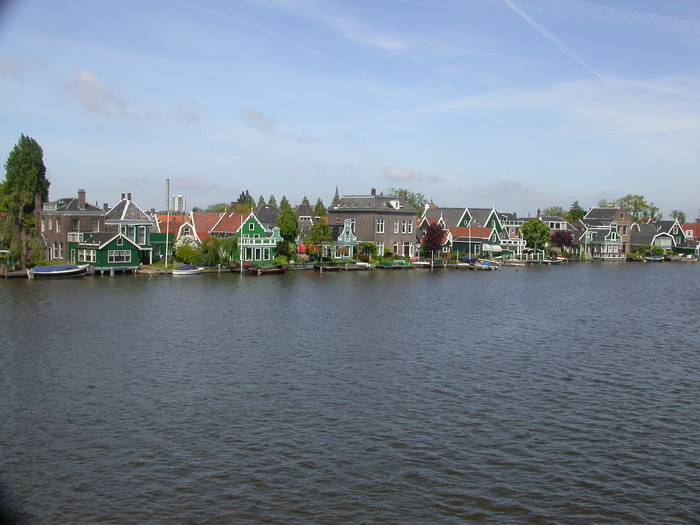 The Zaanse Schans houses are traditionally painted green. No one will say why. My guess is that green paint was on sale a while back. 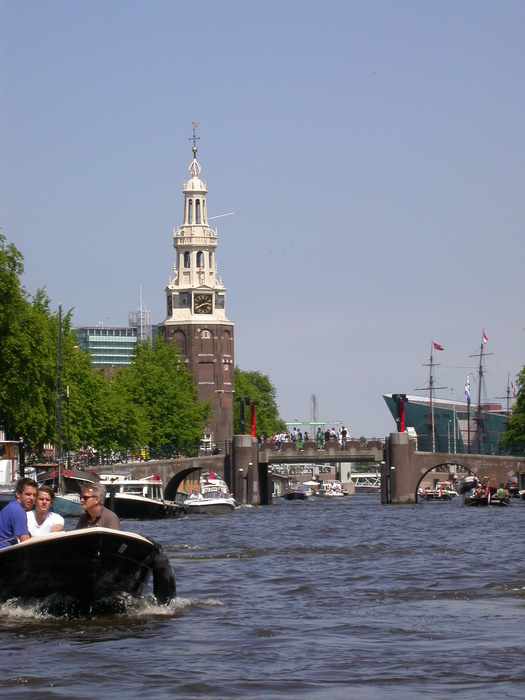 Back in Amsterdam on Sunday, it was a beautiful day for a canal boat tour. Here we're looking back at the Nemo museum (big green thing) and the Montelbaanstoren. It was built in 1516 as a guard tower, on the edge of the Oude Schans canal. In 1606 it was decomissioned as a guard tower and the decorative clockworks added. 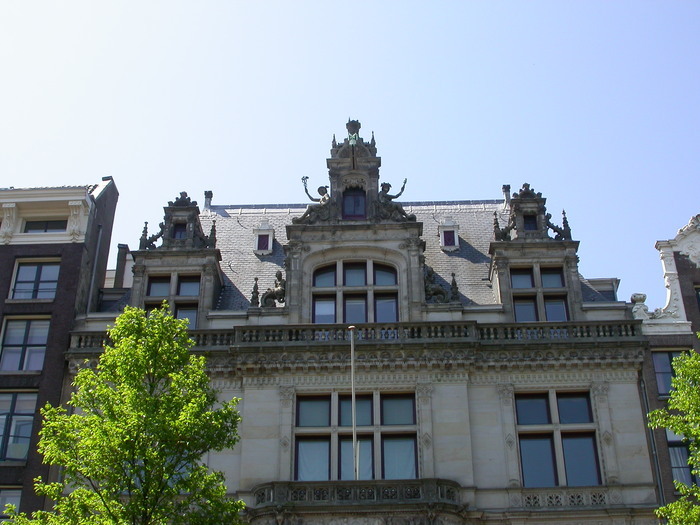 In 1878 the city waterworks moved into the tower, and used it for their offices until 2006. Restoration work has been done on the tower, but it is not yet known what its next function will be. 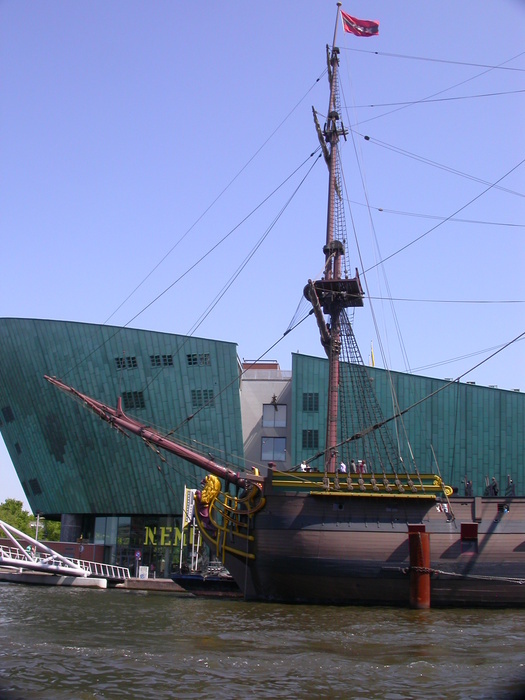 The replica VOC ship Amsterdam, in front of the Nemo. 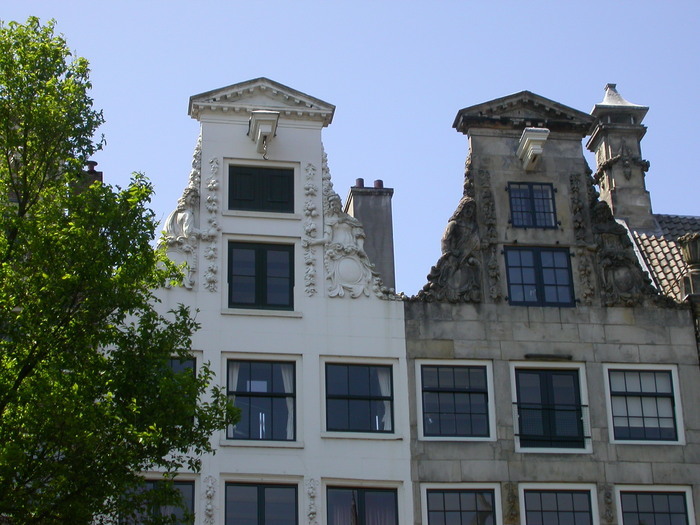 A pair of gevels, as seen from the canal boat. A classic Amsterdam building: rooftop garden, gevel, art-deco font. Who could want more? A beautiful old brick building, with a house boat in the foreground. 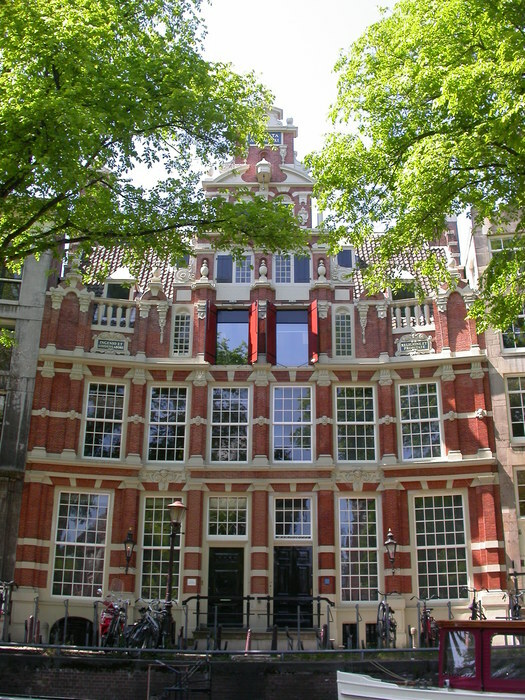 One of the grander houses of the Herensgracht (Gentleman's Canal). Horses on the shutters. The red shutters are classic for this part of town. 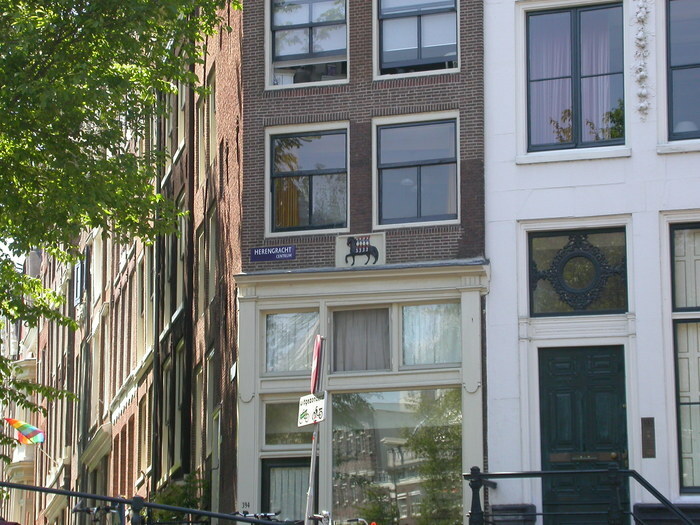 Horse on the gevelsteen. He seems to have had a rough job. 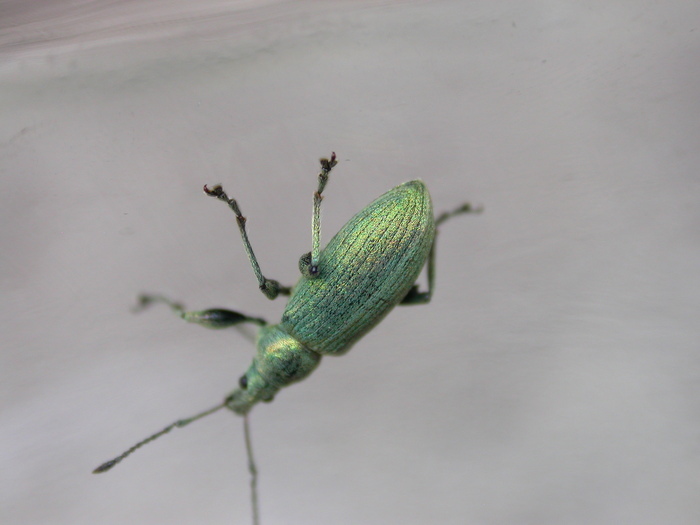 This might explain why some domestic horses have one more vertebra than others. Still more gevels, this time with Hermes. One of our guests wanted to go shopping. I waited outside. 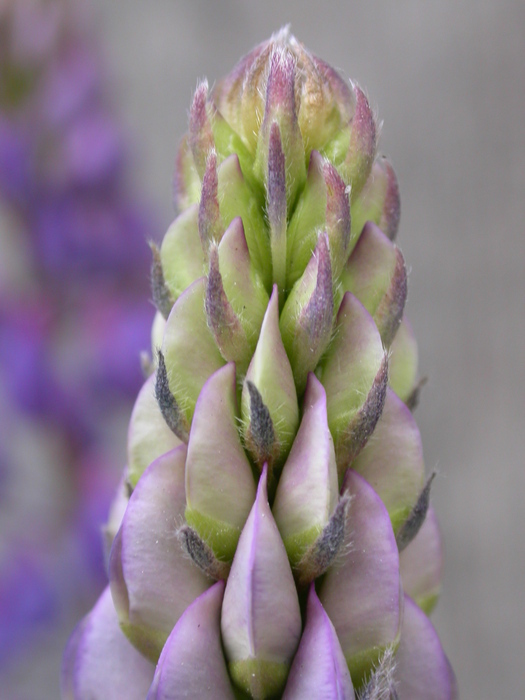 Gratuitous macro photo ensues. 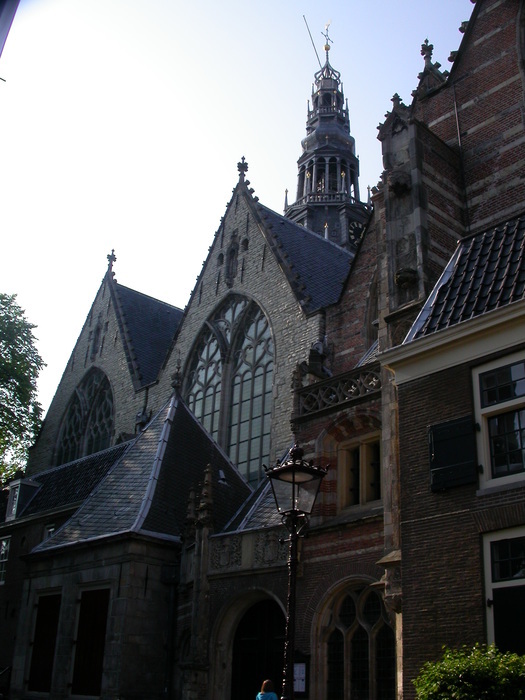 The Oude Kerk dates from 1306, although most of its current exterior was built in 1460. 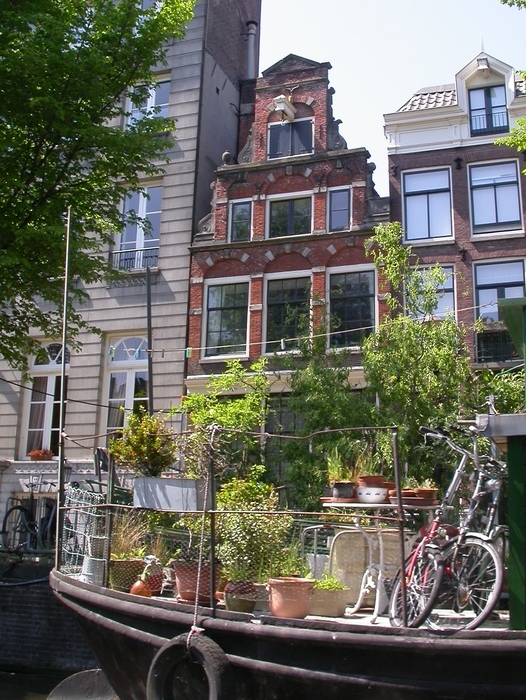 It is situated conveniently in the heart of the Red Light District. 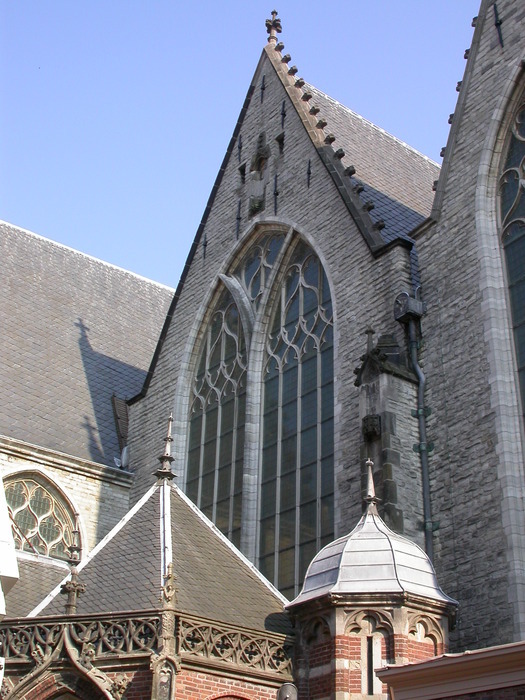 The building shows evidence of its many restorations. Always remember to play with your food. 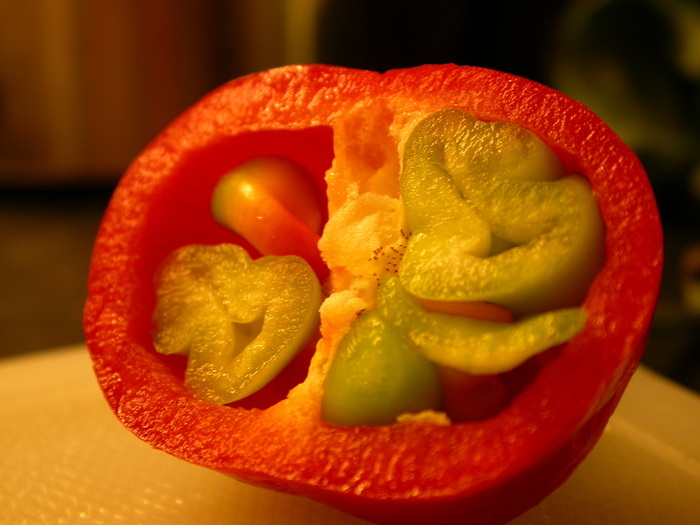 This pepper was growing a second pepper inside it.